Two of our string musicians have performed her for a musical “The Christmas Post”, not the most known and yet one of the best musicals! 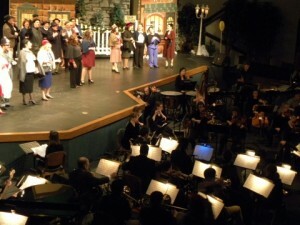 It was a week long production with several rehearsals and three shows. 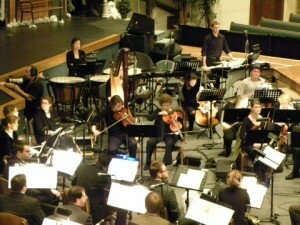 We worked with very talented cast members, orchestra musicians and a dedicated conductor. All of the three shows were full of audience. It was a very rewarding experience for us on a musical level, and we learned a musical that we have never heard of before! This is probably the most beautiful church our musicians have performed at, and it is even more spectacular during Christmas. 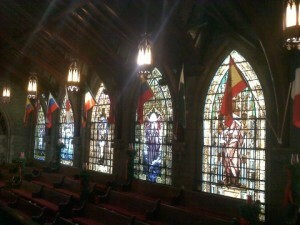 Our string quartet performed in here for a Sunday service. 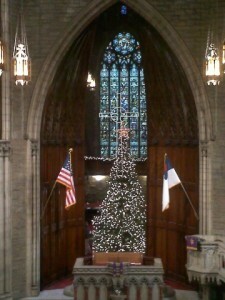 It also has a tallest Christmas tree I’ve ever seen!